The Restaurant with its open show kitchen and wine cellar offers a la carte Mediterranean delights with Asian tastes in a refreshing open-air setting. For classic Home-Style Thai Cuisine, we will present you a separate menu, which includes many famous Thai dishes. Everything is freshly prepared, which means it does sometimes take a bit longer. Special requests are always welcome, so if you are looking for something not on the menu, please let us know. The restaurant features interesting theme nights, such as the Thai Food Lovers Night, the 5 Gems of Asia and various changing activities. The Pool & Lounge Bar, partially integrated into the swimming pool, is open from morning until 23:00. It is especially popular for a sundowner during the extended happy hour (3 pm until 6.30 pm) where guests receive 2 drinks for the price of 1. Comfortable lounge sofas under tropical palm trees invite for a chillout drink and snacks. The underground, cozy Wine Cellar is a unique feature in Phuket. Two flights of stairs down and guests have the feeling to be somewhere in the Bordeaux region. Private dinner arrangements are offered for your anniversary, birthday or any other special occasion. In Room Dining is available all through the day until 22:00. A variety of Western and Asian meals can be served in the privacy of your room. Our Chefs are using only the best and healthiest ingredients available, combining great taste with freshness and health benefits. Unfortunately, the trend of using more sugar and MSG (monosodium glutamate) for Thai food in local restaurants is just getting worse and worse. Both “ingredients” are highly addictive and many Thais now just eat nothing without them anymore. Most of them are unaware of the dangers. Eating in-house however means, staying away from these negative trends. Natural Green Hydroponics Vegetables: We are purchasing all vegetables from one of the best local hydroponic and organic farms, which is the guarantee for best, healthy quality. Prices for organic vegetables are much higher but we believe your health is worth more. Rice-Bran Cooking Oil: The ideal cooking oil for many Thai dishes, as the smoke point is much higher than the one of Palm Oil, which is otherwise used. As Palm Oil is by far the cheapest, it is the cooking oil of choice at all local restaurants. It is at the same time the unhealthiest oil available, so we are not using it at all. Gourmet Olive Oil, Cold-Pressed: Using only best cold-pressed olive oil for all our western cuisine, our guests can easily taste the difference. Olive oils are imported from Spain and relatively expensive here in Thailand, therefore not commonly used in most restaurants. Enjoy our healthy Mediterranean dishes, prepared with gourmet olive oil only. Thai Food Lovers Dinner, only 750.- Baht p.p. net. (special rates for prepayment available online). Every Monday from 7 pm to 9.30 pm our Chef presents a delicious Thai Buffet with a large variety of authentic local specialties. We beautifully present some notorious classics as well as some rare specialities. Thai Cuisine is famous for its intense tastes, herbs and spices and variety. 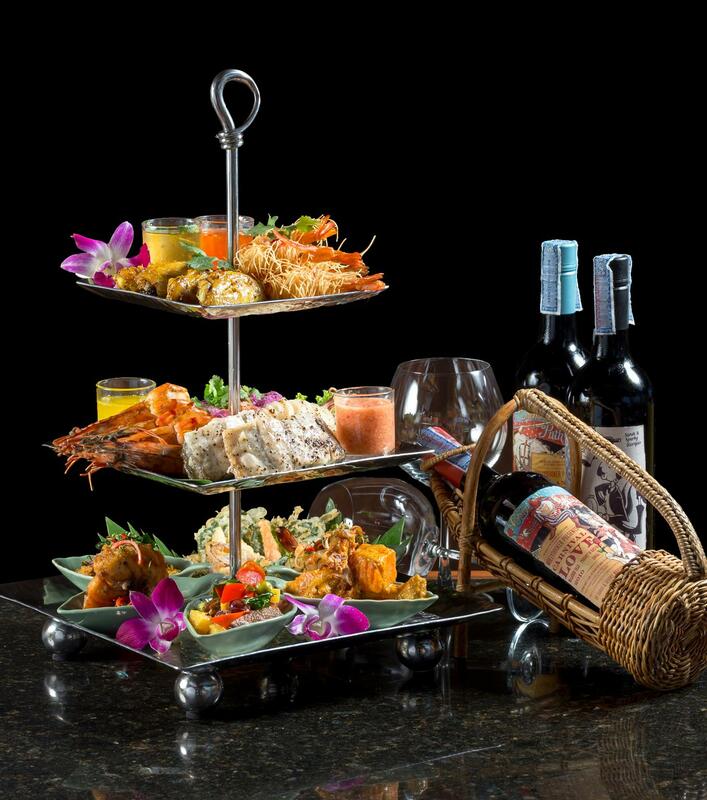 The Thai Food Lovers Buffet Night is ideal to get to know the famous Thai cuisine! Mondays have become so popular with our guests, we do recommend reserving your table in advance. Vouchers can be purchased online at a special price! If you like to see actual pictures of the evenings, here is the link. 5 Gems of Asia, only 950.- Baht p.p. net. (special rates for prepayment available online). Every Thursday from 7pm to 9.30pm, try the most famous dishes from Thailand, Japan, Vietnam, India and China. Beautifully presented, freshly made! Every Asian country has its unique favorite dishes and you get to try many of them on just one evening. Starting from homemade Japanese Sushi, Steamed Snapper, Indian Kadai Chicken Curry, Vietnamese Spring Rolls to the (in)famously popular Grilled Beef Teriyaki, choices are great and nowhere else to find. Please reserve your romantic table on the terrace or purchase both, the Thai Food Lovers Night and the 5 Asian Gems at a discounted price online (prepayment only). Pictures are available here. Enjoy our extended Happy Hour between 3 and 6.30pm around the pool and lounge bar every day! Our pool bar team serves you great cocktails and fresh, draft beer at street prices. Why not just hanging in the pool, getting cocktails served right into it? Meet other guests and enjoy the great afternoon atmosphere. Phuket’s only real underground wine cellar with a nice selection of international wines invites for a drink. Or book your exclusive, private dinner in the wine cellar, ideal for an anniversary or a birthday. Beware, it is sometimes hard to leave! Let us spoil you with a private dinner on your terrace. Our restaurant team can serve you individually in your villa, for a romantic experience in privacy. Enjoy an unforgettable evening with great food and wine.